Everything about Sir Mouse to the Rescue is delightful and you will not find a better collection of short stories anywhere for young children. Mouse and Dragon are best friends. 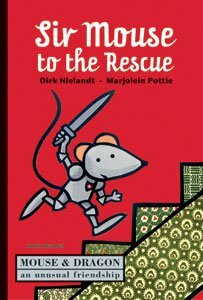 With wit and humour, Belgian author Dirk Nielandt treats us to a very human relationship between Mouse and Dragon in all its wonderful complexity. No didactic 'you must act in this way' preaching to children in this book. Instead, children can explore what it means to be a friend through the adventures of these two, and in their interactions with each other and other characters. Mouse and Dragon are as different as chalk and cheese with Mouse being proud and extrovert and Dragon thoughtful and introvert. Yet this is the strength of their friendship. Rather than being friends because they are alike, they are friends because they like one another. Each brings their strengths to the friendship and helps the other grow. Mouse is hilarious. When the two friends, discover a Prince in a tower calling 'help', Mouse calls back 'How do you want me to help you?' She wonders if he needs help with his homework or is on the loo and has run out of paper! Throughout the five stories, Dragon is generally the one who comes up with solutions to the friends' dilemmas and to smooth things over, even if Mouse is inclined to take the credit. However, the heroic actions of Mouse in the final story in the book 'About War and Friendship' sum up friendship. Marjolein Pottie's illustrations complement and extend the text perfectly with a combination of collage and paper-cutting techniques, True to her character, Dragon appears particularly loveable with her patchwork appearance and Mouse's determination is evident in every depiction. I particularly loved the pages with the paper cutting art which tell the stories in an unique fashion. As with Book Island's other two inaugural titles (read my reviews of Sammy and the Skyscraper Sandwich and Bernie and Flora), Sir Mouse to the Rescue is beautifully presented: gorgeous endpapers, quality paper and would make a wonderful gift to an emerging reader. I look forward to many more translations into English of Flemish children's literature from Book Island.